Oak trees are a member of the beech tree family. The tree's scientific name is quercus or lithocarpus. All oak trees are deciduous trees, which means that they drop all of their leaves during one season. There are more than 400 species of oak trees. Oaks are common in home landscaping, but also grow in the wild. Oak trees are very hardy, and they live for a long time. Many oak trees live up to 200 years or more. According to LouisianaGardenClubs.org, there is a living oak tree near Lake Pontchartrain in Lewisburg, Louisiana, whose trunk is more than 38 feet in diameter. Louisiana foresters estimate the tree -- nicknamed the Seven Sister Tree -- is more than 1,200 years old. Acorns are not produced until the oak tree is at least 20 years old. Some oak trees will take up to 50 years to produce their first acorns. Acorns are produced in the fall, and drop off in late fall and early winter. 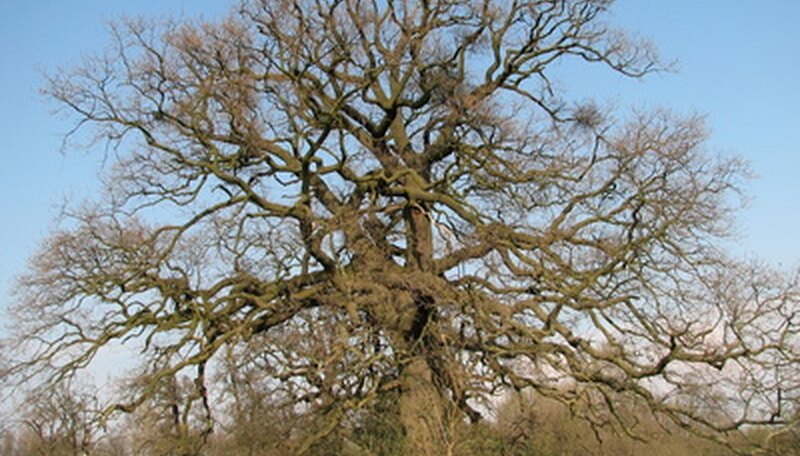 A full-grown oak tree produces thousands of acorns each year. Since oaks grow in the wild and drop tens of thousands of acorns each year, it would seem that there would be millions of oak trees as a result. In fact, however, most acorns that fall to the ground do not develop into oak trees. Acorns are very difficult to germinate, and only 1 out of every 10,000 acorns develops into an oak tree. A mature oak tree requires a lot of water to remain healthy. After heavy rains, or growing along waterways, a full-grown oak tree absorbs 50 gallons of water per day or more. Oaks are amazingly resilient, and rarely fall prey to insect infestations or the infections common in other trees. According to the United States Department of Agriculture, an oak-specific black mold began attacking oak trees along the California coast in 1995. The disease was dubbed Sudden Oak Death. The disease attacks and kills the tree within a matter of days. As of February 2010, Sudden Oak Death had been found in California, Oregon and several other U.S. states, as well as Britain and Germany.